How Far is Sai Dattha Highway View Alwal? HighWay View Alwal is one of the most prestigious and elegant residential complexes that is coming up. 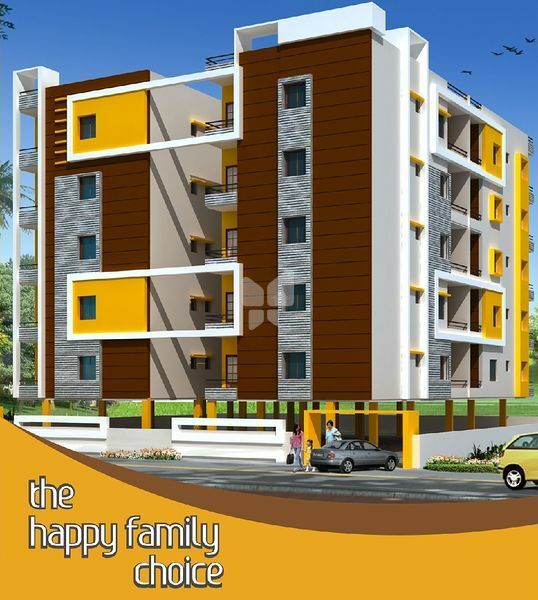 Natural grandeur comes up impeccably with the hi-tech bedsits to offer a construction marvel. It looks like a majestic residence where contemporary day elites will find the decisive luxuries to live. The entire composite is cordoned off with peaceful edging that can relax one’s mind. Framed Structure: Earthquake resistant foundation with R.C.C. framed Structure. 9” external walls and 4' 1/2” internal wall with AAC blocks (Autoclaved aerated concrete). Internal / External: Double coat cement plastering with sponge finish. Internal Doors:Teak wood frames with flush door shutters with standard hardware fittings. Wood/UPVC/Aluminum windows fitted with fully float glass with M.S. safety grills. Vitrified tiles (24”x24”) in all rooms, and ceramic tiles in balconies. Kitchen: Glazed ceramic tile dado upto 2 height. Bathrooms: Antiskid ceramic tile flooring, dado up to door height. Toilets: EWC with flush tank of Cera or Equivalent make. Hot and cold wall mixer with over head shower in all toilets. All C.P. fittings are chrome plated of Jaguar / ESS or Equivalent make. Glazed ceramic tile dado up to 2 height. Granite platform with stainless steel sink. Provision for fixing Aqua Guard, exhaust fan & chimney. External: Cement based water proof paint. Internal: plastic emulsion over luppum in all rooms.. Concealed copper wiring of Finolex or Equivalent make in PVC conduits. Power outlet for air conditioner in all bed rooms, geysers in all toilets. 3 phase supply for each unit and individual meter boards, modular type switches. Telephone points in master bedroom and drawing areas. Intercom connectivity from central security to all flats. T.V. 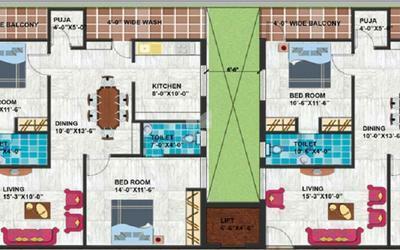 points in master bedroom & drawing room. Provision for Cable Connection in Master Bedroom and Drawing Room. 6 passengers lift of reputed make.